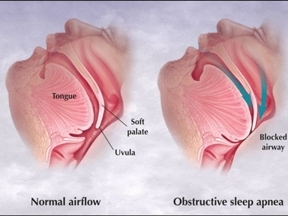 Obstructive sleep apnea (OSA) is a sleep disorder that involves cessation or significant decrease in airflow in the presence of breathing effort. It is the most common type of sleep-disordered breathing and is characterized by recurrent episodes of upper airway collapse during sleep. These episodes are associated with recurrent oxyhemoglobin desaturations and arousals from sleep. Generally, symptoms of OSA begin insidiously and are often present for years before the patient is referred for evaluation. The SRBD continuum suggests that snoring is the initial presenting symptom, and it increases in severity over time and it increases in association with medical disorders that may serve to exacerbate the disorder, such as obesity. 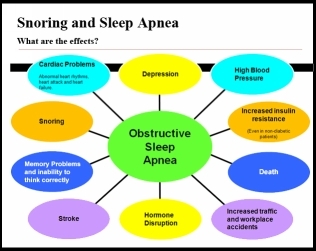 Snoring has a constellation of pathophysiological effects. As the disease progresses, SRBD patients begin to develop increased UA resistance that results in a new hallmark symptom: sleepiness. Sleepiness is caused by increased arousals from sleep. Scientists at the Madigan Army Medical Center have recently studied the incidence of sleep apnea in military personnel They observed that Sleep disturbances, however, are increasing in frequency and are commonly diagnosed during deployment and when military personnel return from deployment (redeployment). Recent evidence suggests the increased incidence of sleep disturbances in redeployed military personnel is potentially related to PTSD, depression, anxiety, or mTBI. .
short sleep duration (SSD) was highly prevalent in the study, with a self-reported sleep duration average of 5.74 h of nightly sleep and 41.8% sleeping 5 h or less per night. This finding is consistent with prior studies of military personnel who habitually report SSD. Compared with civilian reports, these findings are substantially higher than the 9.3% prevalence reported in the adult population in the United States. Military personnel with the diagnosis of pain syndromes were more likely to have insomnia. Poor sleep is a recognized symptom in individuals who have medical disorders associated with pain. Previous studies using both questionnaires and PSGs have reported patients with pain have difficulties initiating and maintaining sleep, supporting the association of pain syndromes with insomnia., In the study’s cohort, 24.7% were identified as taking medications for pain. “The Veteran had a VA examination in October 2009. The Veteran reported sleep apnea with an onset two to three months earlier. The VA examiner opined that, per medical literature review, sleep apnea is not caused by or aggravated by the Veteran’s PTSD. The VA examiner stated that the basis of the opinion was the review of medical literature. The literature was not specified. At the Board hearing in March 2012, the Veteran testified that his therapist has told him that PTSD aggravates sleep apnea because he has nightmares and dreams in his sleep. The Veteran testified that he has anxiety attacks in his sleep that keep him from catching his breath. The Veteran testified that he has used a CPAP machine for about four years. In this case, there is positive medical evidence which links the Veteran’s current sleep apnea to service-connected PTSD via aggravation. The most probative opinion is that of Dr. T which not only provided a link between the Veteran’s PTSD and sleep apnea (by aggravation) but also was supported by submitted medical literature. Despite the negative VA opinion, in light of the positive medical opinions from the private psychologist, the Board finds the evidence is at least in equipoise regarding whether the Veteran’s sleep apnea is aggravated by service- connected PTSD. Accordingly, resolving all reasonable doubt in the Veteran’s favor, service connection for sleep apnea is warranted. – Gilbert v. Derwinski, 1 Vet. App. 49 (1990); 38 U.S.C.A. § 5107(b).